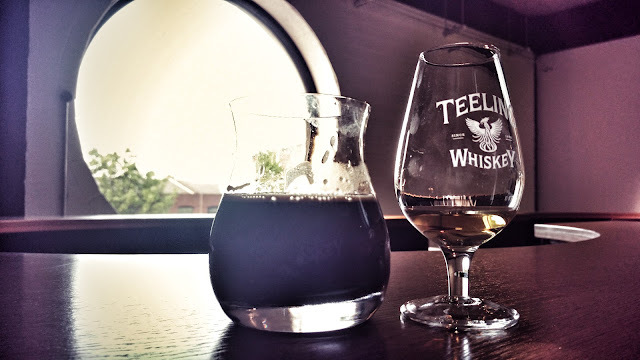 Surprisingly, I had never been to the Teeling distillery in Dublin until last week. I was invited along to take a look at the distillery and try the recently released version of Galway Bay: 200 Fathoms, despite the beer having launched in early March. This was the media launch I guess. Our energetic and informative guide brought us around the distillery and explained everything. For the most part, it's the same as any brewery. I was surprised to see them use wooden fermenters in such a new facility but it lends something to the finished product I'm told so that's okay with me. They look beautiful. 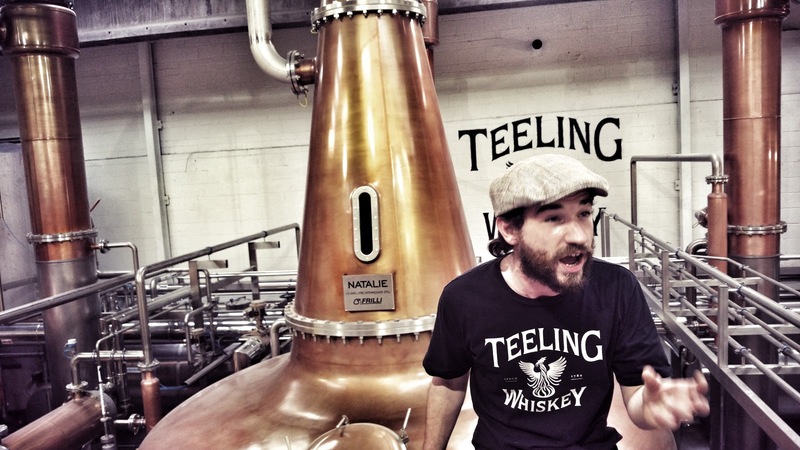 For those that don't know, the Teeling family has been involved in whiskey since 1872 on and off. The original distillery was in Dublin back when Ireland was the capital of the world in whiskey exports. A number of events occurred to end our reign as the top whiskey producer in the world. Prohibition in the US, World War 2 and our own war of independence and civil war. Our export options were now gone and our own population wasn't enough to justify the number of distilleries in operation. In 1985, John Teeling bought a former state potato schnapps distillery in Louth and set up Cooley, Ireland's first new distillery in decades. 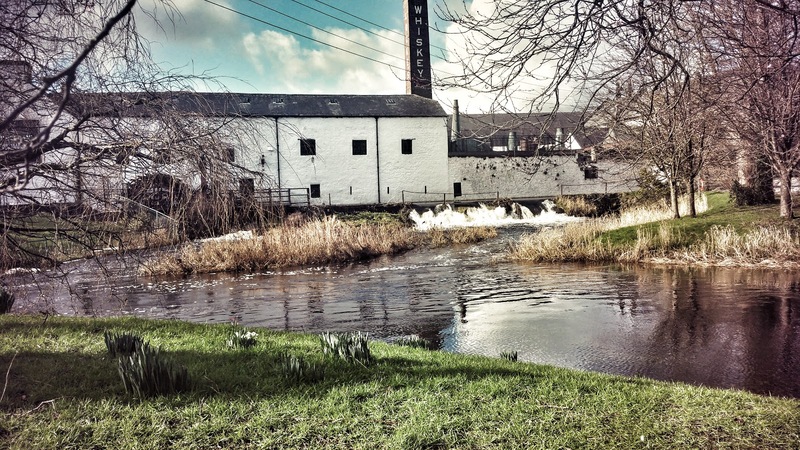 It remained as Ireland's only independent distillery until late 2011 when it was sold to Jim Beam which has since itself been sold. Cooley is now part of Beam Suntory. It's worth noting that Cooley also owned the old Locke's distillery in Kilbeggan which is located 10 minutes down the road from me. It's an excellent tour and well worth visiting. I would imagine that the proceeds of this sale allowed the Teeling family to consider opening up a distillery in their ancestral home of Dublin again. The site of the original distillery was gone with apartments in its place so they selected a nearby area near the Guinness brewery called Newmarket. It's a cool spot that has long been neglected but the addition of the Teeling distillery could see it become like a smaller version of Smithfield. 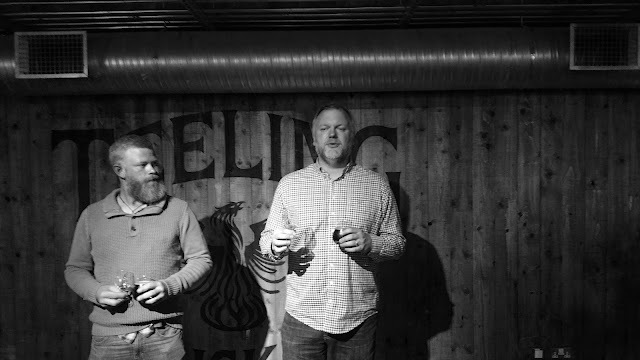 Will Avery, head brewer at Galway Bay Brewery and Alex Chasko, master blender at Teeling Distillery had a discussion about the development of 200 fathoms. Each talked about the beer and the whiskey and then were let in on a little treat. It turns out that the barrels used in 200 Fathoms were then used to age a small batch of whiskey, similar to the Jameson and Franciscan Well Stout Barrel collaboration. I don't think it was planned to let us taste it but we all got a small sample of it. I'm not 100% sure if it has been released yet as I haven't seen it. It's pretty tasty and you can get the stout somewhat. That said, I did find it a little syrupy for my tastes. It was just a little too viscous unlike the Jameson version which is surprisingly good. Unfortunately, I neglected to take a picture of the bottle. The end result is here. A glass of 200 Fathoms and a little of the Teeling Small Batch whiskey. 200 Fathoms was aged in the same ex-rum barrels that are used to age that whiskey. It's a beautiful marriage of imperial stout and whiskey notes. I have a number of bottles of 200 fathoms from the last few years cellaring at home. I'll have to do a comparison one of these days. Thanks to Teeling and Galway Bay for the invite. It was a great event that ended up with a load of us walking to The Beer Market for afters. If you don't want to read a bit of a rant, best stop reading here. Since I'm writing about Teeling, it might be worth bringing up a slightly touchy subject and my own opinion on it. It was brought to my attention on Facebook a few weeks ago that there's some controversy with the barrels that Teeling use. They are ex-rum barrels from Nicaragua, specifically from the producers of Flor de Caña rum, or so I was told. Apparently, the company that owns that brand owns the sugar cane fields used to produce that rum and a number of other sugar based products. It would seem that at least 20,000 people have died of chronic kidney disease (CKD) in Central America in the past two decades. A number of those would have worked in fields used to produce the sugar used in said rum. The disease is said to be caused by overwork, lack of shade, lack of water etc although no scientific study has proven that. If you want to know more, here's an article in The Guardian. 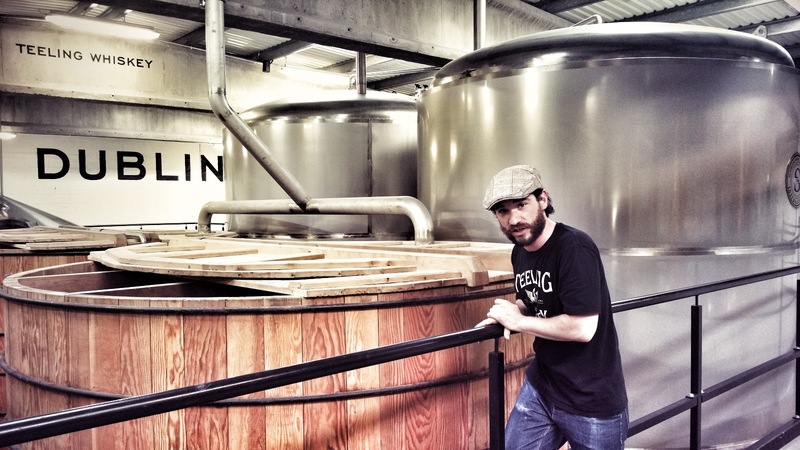 The Facebook post was pretty heated with people calling for Teeling Whiskey to be boycotted until they stop using those barrels. Someone said the barrels needed to be ditched. I stepped in with what I hope was some voice of reason. If I can take a step back and look at this dispassionately. All Teelings did was buy old barrels from a rum producer or perhaps a 3rd party. Would that be accurate? Or are they in some sort of ongoing deal with Flor de caña? Can they really be blamed in any way? They are essentially recycling the barrels. Should they be expected to destroy them and buy different ones because of harsh working conditions among sugar farmers? Can Teelings really be blamed? Even indirectly? I'm not familiar enough with Teelings or how they produce their whiskey to be outraged by this yet. it's just someone else suggested they need to ditch the barrels and to suggest that means they would need to ethically destroy them. To pass them on or sell them would be hypocritical if they are ditching them on ethical reasons. I won't mention where any of these comments came from but my point was that Teeling shouldn't be held responsible for the treatment of workers in sugar cane fields just because some second hand barrels they use can be linked indirectly to their plight. It's all very well for us to sit behind our expensive computer screens in one of the richest countries in the world and be up in arms over the plight of the those in less well off countries. The problem is, if you look hard enough, you will find many everyday products have some sort of link to some sort of injustice. The computer, phone or tablet you are reading this article on was likely manufactured or has many components manufactured in a country with questionable labour conditions. You might as well boycott everything mass-produced and just produce everything yourself while living off the grid. You would probably have to build your own tools while you're at it, just to be safe and of course spin your own fibres to produce clothes after you have built your own loom because the manufactured ones probably contain materials of questionable origin. This has turned into a bit of a rant on the proliferation of PC craziness that has been sweeping across richer countries in recent years. I'm a realist myself so will not be put off by this and I certainly won't be boycotting Galway Bay because their 200 Fathoms was also aged rum barrels. Can we apply a little common sense to this PC crap please? I agree that Teelings should not destroy the rum barrels that they currently use- The people who would be more linked to the CKD controversy already have Teelings money and destroying the barrels is not going to change that. However, I would be very disappointed if Teeling bought from Flor de Caña again if conditions didn't change. I also think it might be a bit of a wake up call to small businesses to consider some form of ethical monitoring when transacting business in the future. I agree with that yes. Now that they know, I would imagine that future barrels will be sourced elsewhere.